If you have been watching my updates lately you have seen me reporting new finds in Harlem. I have been doing this with the new Nokia Nuron and Ovi Maps. Last month this mobile device was launched and we created the social platform and campaign that allows you to update your status through our banner ads, widgets, FB app. Instead of limiting our audience to just facebook, we used a new social authentication API called Socialize from Gigya. This new service opened up the entire social web to our audience. From any one of our banners, widgets or sites you can update your status and share your location. The Gigya Socialize service aggregates authentication and social APIs from Facebook Connect, MySpace ID, Twitter, Google, Yahoo, and AOL to allow for easy sharing. You can see it in action in the widget above. So...Where are you right now? Click the "share" button on the widget and let me know. ON: Your Location. Location. Location. 2010 is shaping up to be the year we all share our location. The proliferation of location-based services (LBS), (also known as tagging, checking in or location-based social media) has finally reached a tipping point. While geo-tagging has been around for years, this year's SXSW conference in Austin, Texas, proved to be the location based service's Quinceañera. LG has launched a fantastic promotional site. The new Smart Light monitor site offers you a front seat to in depth discovery while taking on a worthy cause. LG's technology works like an owls sight. Its predictive features are integrated into this well designed site. When you play with the site's functionality and navigation you realize that the site holds the promise of the product incredibly natural ways. The curios clue finder ties in a social media streams by taking in feeds from Flickr photo pools and YouTube content that allow the user to experience detailed discoveries. This functionality is perfectly designed as it does not attempt to "build community", which is a mistake that many brands make. The design aggregates existing content and uses it to entertain and inform the user. In my opinion, this the way we should be looking at utilizing social media platforms and their functionality. When you visit the showroom the site offers one of time most beautifully designed demonstrations of technology that I have seen in a long time. The Cinema mode is captivating. It made me want to trade in my Apple display for the Smart Light monitor. What would a 2.0 site be with out a widget for bloggers? Now most of you know that I think that in the past year widgets have just been abused. A widget is there to facilitate the spread a good idea - it is not the idea. This one gives me a real reason for displaying it on my blog. If I can save one animal it was worth posting it. The only criticisms I have of the site is that the writing could have been stronger by explaining the humanitarian reason for deeper engagement, the site and content is not coming up in search engines as well as it could have and in the widget section the drop down menu used to select your country is a bit over designed and hard to get to your country easily. I am a tennis junkie. So when I was on LinkedIn this morning the IBM Ad unit with live US Open scores caught my eye. When I looked closer I noted that IBM created a simple scores widget as it is one of the big sponsors of the US open. I love the menu at the bottom which opens a plethora of of options like the IBM innovations at the Open, mobile scores and popular photos. Nice Work - This widgets packs a hard serve at creating a reason to install a branded widget on this page. Tons of utility! Go Serena & Nadal Go! Just when we had all written off IMAX, they launch The Dark Knight and inject a new spectacular experience for movie goers. All of the sudden the movie theater tickets were worth it again! So now that you have the Dark Knight under your IMAX belt it is time for you to surround yourself with Bono, Edge and gang for an energetic ride in U23D. As a U2 fan who did the Veritgo tour while in chi-town, this is a stunning production that puts you in the eclipse pit of the Argentinean stage. 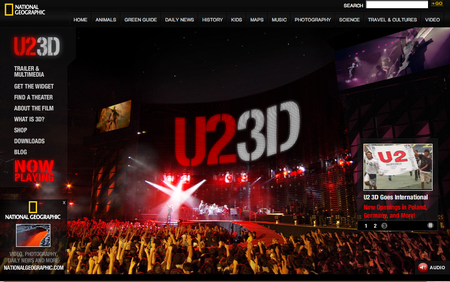 U23D is the first digital 3D, multi-camera, real-time shoot. It is the largest collection of 3D camera technology ever assembled for a single project. For those of you who have invested in the home theater with surround sound and stadium seating - IMAX has made the movies magical again. Seems like a fine time to go hang at the movies again. Thanks IMAX! "NIKE, AKQA and MindShare Partner to Change Widget Advertising For Good" was the headline of the press release that I received in my ON: Inbox last week. While it peaked my interest it also gave me pause and reminded me that "change begets more change". Widgets are not a new change for consumers. What has changed is our use of them as an easy way to distribute content for brands by sharing the content and functionally in them with our communities. the brilliant marketers at NIKEFootball know that the brand site, at launch, is a place for consumers to fall in love and share. In an attempt to deliver on of the largest video widget campaigns ever, the European Soccer Championship, Eyeblaster, NIKE, AKQA and Mindshare worked together to extend the reach of NIKE branded football films found on its groundbreaking NIKEFootball website. NIKEFootball’s video widget campaign moved across more than 10 countries, revolutionizing the way any brand has ever used ad serving technology. The campaign uses bought/paid media combined with Nike Media (ie sites, banners and applications) to inspire earned / consumer generated media across the globe. Eyeblaster, home of the world’s most innovative integrated digital marketing solutions has been selected by global advertising agency AKQA and worldwide media agency network MindShare to serve and measure innovative branding video widgets for NIKE across 10 countries. As part of a multi-faceted campaign that crosses multiple borders, the widgets leverage Eyeblaster’s digital expertise and technology to enhance user experience and brand integration for one of the most well-known brands on the planet. NIKE’s new campaign uses ad-unit content distribution (ACD) to extend the reach of NIKE branded football films found on its groundbreaking NIKEFootball website. AKQA designed the NIKE widget to showcase video using well known sporting and media celebrities to deliver NIKE branded content directly from a video banner ad to social networks, homepages, blogs, etc. “The widget represents fresh thinking that adds value to consumers' experiences of the brand. It allows us to sustain a 3-way dialogue between Nike and consumers and amongst themselves, throughout the campaign and beyond, by continually refreshing our messaging and the functionality of the widget,” added Hani Mahdi, account director at MindShare WorldWide. To maximize ad spend and add a viral aspect to the campaign, AKQA integrated seeding technology with the video widget. The seeding technology is powered by Gigya in cooperation with Eyeblaster. Users can “grab” the widget from the website they are looking at and install it on their social networking page. 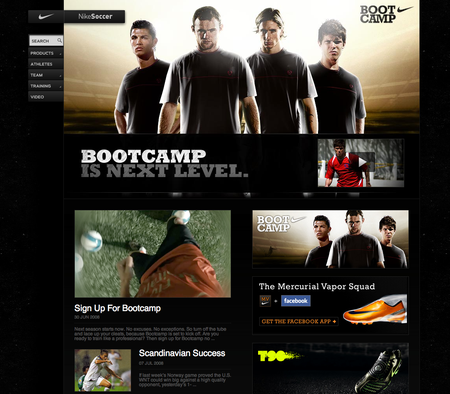 This opens a direct, permanent communication channel with users where NIKE can update video content at anytime. The campaign is being served and measured using Eyeblaster’s Ad Campaign Manager (ACM) platform. With ACM, AKQA and Nike can access data consolidation and manage geo targeting, dynamic content and global distribution from one platform. This does not feel new, but it sure feels big. Perhaps the change they speak of is when a big brand like Nike pushes the limits on content and distribution perhaps it will inspire other categories to follow suit with relevant content that will inspire brand love. If this is the LARGEST WIDGET LAUNCH EVER - Does anyone know which widget sharing platform they used? I scrubbed the code and it looks like Gigya has done it one more time! It just seemed highly unlikely that they would re-invent that wheel at the brand's expense. "Appeal to teens and drive up household penetration." When we visited Dibs (Dreyers Ice Cream) in Oakland, CA last fall that was the goal. The snacking teens was the target. How does Doing Dibs Instead, talk to teens? After a Flora Dora sitting at Five Ninth and a few notes on the back of a cocktail napkin the light bulb went off. Aha! The idea could only take flight with a partner who could help us reach teens on every imaginable medium. I called my buddies at MTV's Generator and we jumped in to action together. Then and only then could we make people who Do Dibs Instead Famous. Thus the birth of the Dibs Film Festival. The Dibs brand could facilitate teens fame by holding a "Do Dibs Instead" Film Festival. The festival could inspire earned media with a chance at something they desire most - it had to be something more than 15 MB of fame on YouTube. We would allow their proclamations of brand love to be the next Dibs spot on MTV. A full month after the launch at the MTV Movie Awards, the banner ads were live, the TV spots began driving awareness and the consumer generated videos in widgets were a blazing across the internet. Teens seem to be doing exactly what we hoped the campaign would do which was inspire Do Dibs Instead videos, organic content has began popping up and kids are buying packs of Dibs to appear in their home videos. We have done exactly what we set out to do. While the idea was simple - this was not an easy production. As many of you know I gave birth to this idea at TracyLocke then in between gigs (my move to Wunderman) I spearheaded the digital, along with the writing stylings of Snack's Jennifer Leuzzi, which serves as the conversation hub that the broadcast and out of home creative continues to feed into. There were many production and technical partners involved. Some of those partners were great... and others not so great. When I look back at the the temporal design specifications what I see is a Behind The Music style list of functionality created to engage the consumer. When I revisited it, the document tells an in depth story and shows which partners were miscast and which did not know how to follow Web 2.0 production standards. It was Cannes Candy. And of late it has rocked the pages of this blog. Yup this widget created by Tokyo Agency Projector took top honors in the titanium and integrated category at the Cannes International Advertising Festival today. I first encountered this retailer when their pop up location appeared on the upper west side. I fell in love as I think the evolution of the t-shirt is something that you can exploit in our creative life.